The story of Jacob's wrestling with the angel provides an embarrassment of riches for homiletical possibilities. There is the mysterious incarnation of God into human form; there is the act of wrestling which simultaneously connotes both intimacy and struggle, but ultimately yields a blessing; there is the theme of identity that is connected to one's name -- and, of course, there is the new name given to Jacob by God. In fact, this account is one of the most extensively interpreted stories from the book of Genesis, for good reason. 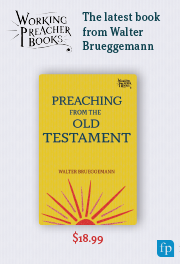 Walter Brueggemann explains, "Its rich expository possibility is based in part on its lack of clarity, which permits various readings. "1 Though there is much in this text that is strange, or left open, the literary details demand a closer look and can yield even more exegetical treasures. At the beginning of Genesis 32, preceding the lectionary pericope, Jacob has heard that his brother Esau is coming to meet him, accompanied by four hundred men (32:6). Jacob's response is to panic (32:7), because he assumes Esau is coming to attack him (32:8). The subsequent verses narrate Jacob's prayer to God for deliverance, and his plans of how to minimize the damages, plans that include sending a present to Esau, and dividing his camp. Our text begins with Jacob sending his wives and children across the river Jabbok, an eastern tributary of the Jordan located about twenty miles north of the Dead Sea, at the border of Ammon (cf. Numbers 21:24, Deuteronomy 2:37 and 3:16, Joshua 12:2, Judges 11:22). The river's name, Jabbok, plays on the name Jacob, and is related to the word "wrestle"). Genesis 32:25 starts with the emphasis on Jacob's solitude, and it is while Jacob is alone, in the night, at the ford of the Jabbok that a yet unidentified man wrestles with him. Perhaps Jacob thought his wrestling partner was Esau, though this mysterious man could also symbolize others with whom Jacob had wrestled in his life, including his father Isaac, or his father-in-law, Laban. There is very little detail given to any specifics about the wrestling match except for its length; it lasts until the dawn is about to break. At that time, "he" sees that he is not able to prevail, and responds with a physical blow to Jacob's thigh or hip (cf. 32:32). The NIV and NASB translate this action as "touched," but the NRSV "struck" is also possible and could suggest more violence or force. Indeed, the result of the action is that Jacob's leg is put out of joint. But still, Jacob does not let go. In 32:26, the wrestling partner voices his request that Jacob do so because the dawn is breaking. Terence Fretheim points out that the danger is not that God would be harmed by the daylight, but that Jacob would; "If Jacob holds on until daybreak, he is a dead man! "2 Jacob refuses to do so until he receives a blessing. The blessing, though, does not immediately happen. Instead, a conversation about names ensues. In 32:27, we read, "And he said to him, 'What is your name?' And he answered, 'Jacob.'" Jacob's name has varyingly been translated as "heel/trickster/over-reacher/supplanter,"3 and Jacob must articulate this name, with all its connotations, to God. But God replies by doing two things: 1) identifying himself as the wrestling partner, and 2) by giving Jacob a new name (32:28). 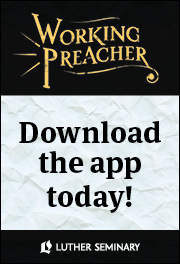 Jacob, then, wants to know God's name, softening his request with the word "please" (32:29), but God responds with a question, asking Jacob why he asks. The text gives us no response from Jacob. Perhaps God's question has silenced him. But if God's question is the final word in the dialogue, it is not the final action: the last clause of 32:29 reports that God blessed Jacob. The last we see of Jacob in this pericope, he names the place Peniel ("the face of God") to represent his face-to-face encounter with God, and he limps away into the sunrise because of his hip. Immediately following our text, Genesis 33 recounts the meeting between Jacob and Esau. Before Jacob wrestled with God, he feared the encounter with his brother. But it proves to be a gracious one, and Jacob goes so far as to tell Esau, "I see your face as seeing the face of God" (33:10). Jacob's new name, Israel, is defined by the narrator in 32:28 as "he struggles (sarah) with God," but its actual linguistic etymology is better translated as "God struggles" or "God rules." That is, Jacob does not only wrestle with God, but God wrestles with Jacob. And it is costly for Jacob: he is marked and wounded after it, something that is meant to be remembered by all who follow the dietary restriction mentioned in the final verse of our text (32:32). We would become far-reaching and nameless. And the success itself makes us small. Will not be bent by us. Like strings making deep melodies. Which, as if sculpting, nestled round him. Winning does not tempt him. Deeply defeated by the ever-greater One. Certainly, we all experience times when we feel as if we are wrestling with God. And many of us are marked by the wounds we have sustained from our struggles. This text reminds us that God is wrestling with us, and we grow in that process. 1Walter Brueggemann, Genesis. Interpretation. Philadelphia: John Knox Press, 1982, p. 266. 2Terence Fretheim, "Genesis." New Interpreters Bible Volume I. Nashville: Abingdon, 1994, p. 566. 4Ranier Maria Rilke, The Book of Images. New York: North Point Press, 1994. Join Profs. Karoline Lewis, David Lose, and Matt Skinner,for a conversation around preaching the lectionary texts for the Twenty First Sunday after Pentecost.